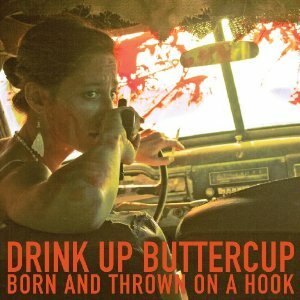 Drink Up Buttercup draws inspiration from a multitude of sources for the hyper-eclectic music on its debut, Born And Thrown On A Hook. The eccentric pop of the early Bee Gees and Syd Barrett readily comes to mind, as well as the vocal hijinks of Queen, but there are also elements of Monty Python, vaudeville, Gilbert & Sullivan, and Saturday morning cartoons. These Philadelphia based jokesters not only throw in the kitchen sink, they dress it in an Edwardian suit and give it a mic. In addition to wry epics like “Seasickness Pills” and “Lovers Play Dead,” Drink Up Buttercup offers brief and spooky instrumentals like “Animate The Hangtime” and “Who Spilled The Beaker.” “Young Ladies” is lighter and more ornate, while the straight ahead garage rock of “Heavy Hand” sounds like something that would catch Jack White’s fancy. “Sosey Dosey,” a tale of two kids who keep falling down is just too silly to work, and the band lets its ambition get out of hand on the disjointed finale, “Maestro Monsignor.” Overall, the CD is a worthwhile adventure, and it sure would be fun to see Drink Up Buttercup try to pull off this three-ring circus in a live performance.